Who do you think you are kidding Trevor? As the one responsible for getting the now legendary Nunn/Rattle Porgy and Bess produced at Glyndebourne - wow! twenty years ago - it was in 1986 - I was much entertained by the piece in the NYT this morning about Trevor turning it into a "musical" - allegedly to make it more "accessible". Well it may very well do so but it has little to do with respect for the piece. Its all about MONEY! Thats fine - good for them, but please don't pretend it has much to do with anything else! Seeing the reference to "permission" from the Gershwin estate I have to observe how times have changed. I had to deal with the lawyer for Ira Gershwin's widow, Lee. She was the dominant family member at that time and was ferocious in her actions to protect the work from "vandals" - as she saw them. I convinced her that the team we had put together would do the thing properly. We were proud to have her at the premiere and thrilled when she pronounced Trevor and Simon's work the first production ever that she felt truly matched up to the vision of the Gershwin brothers. And I guess she had seen them all. Back in the office - and many are off already for the long long weekend. So it is quiet here and I can get on with some things without so many interruptions. Santa Fe was a refreshing interlude, and a useful one in particular in that it allowed me the opportunity have a series of excellent discussions with David Holloway about the joint CCPA/COT diploma program. It has now been going for two years and we will be tweaking it somewhat - continuous improvement is what we are always after of course. Before I left for Chicago yesterday I had a good hour wandering around that pretty town seen here yesterday morning in glorious sunshine. And then up to the opera for another convivial lunch at the wonderful cafe/restaurant they have on site. Their excellent gazpacho is my favorite. And so an easy journey home arriving last night at 10 pm. This blog will be quiet over the coming days unless anything in particular crops up. For now you may wish to congratulate the new Opera Cleveland on appointing Richard Buckley as Principal Conductor. That is a very good move indeed for this new company which was formed by the merger of the city's two leading professional opera companies, Cleveland Opera and Lyric Opera Cleveland. And COT as well as Music of the Baroque fans will be interested to see how Jane Glover and Mark Morris have done Purcell's King Arthur at the English National Opera. Read about it in The Times. I should warn you however that the reception was not unanimous. There was an excoriating (what a vividly descriptive word that is) review by Rupert Christiansen in the Telegraph. I wont link it - you can find it for yourselves! But the Guardian however was on the side of The Times. Ann Sophie von Otter undertook her first Carmen at Glyndebourne a couple of years back. It was distinguished, but a first Carmen nevertheless. By the end of that run of some 15 performances it was by all accounts already remarkable. And now she is doing it in Santa Fe and I was at the Dress rehearsal yesterday evening to see one of the truly great assumptions of this complex role. We all know what a spectacular artist she is - the serious intellectual honesty and responsibilty of everything she does always brings insights be it in Handel, Mozart, Lieder, opera - everything she turns her attention to is illuminated by her acutely sensitive musicianship and glorious singing. And now we have a truly great Carmen with the excrescences of ages pared away - not a vocal musical or dramatic cliche in sight. The work is new and it is thrilling. Not to be missed and worth the voyage! And by the way aided and abetted by Alan Gilbert who seems to be developing into an opera conductor of importance. And note too the extraordinary sound of a chorus populated by 40 of the most gifted young singers on the continent, hand picked - wonderful! 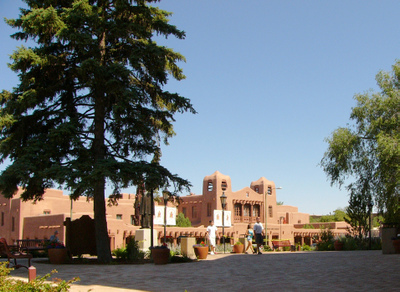 I now realize that this is the thirtieth anniversary of my first visit to Santa Fe in 1976. Whilst this has not alas been an annual event it has been frequent enough over the years for me to have seen some remarkable performances and productions in this truly magical place. So it is with some disappointment that I can not stay longer this time. I will be back! Will go up to the ranch this morning for lunch and then to the airport at Albuquerque - a nice 60 minute drive. One again there will be some old friends to see. Yesterday it was Richard Stilwell and Judith Forst - both here as Cinderella's parents in Massenet's opera Cendrillon - to be given here for the first time. My computer is still sick so I will be signing off now until tomorrow! Had a long journey down here yesterday but arrived at 6pm and found my old friend and colleague David Holloway in his office at the Opera. David now runs the apprentice program here (this is his second year) and he is revelling in it and is greatly loved here of course. He was an apprentice here 40 years ago and seems as young now as ever. It is great all round for him to be in this position - a natural habitat for him. And there appears to be a terrific crop of apprentices this year including at least four alums of COT. Also a couple who got away from us whom I was extremely anxious to have in the company. Went off to dinner at the excellent Diego's and then to a dress rehearsal of the new Zauberfloete which opens on Friday. This is a new production by Tim Albery, a great director who did a fine Beatrice and Benedict here in 2004. Not sure that he is ideal casting for the Flute - but time will tell. This was the first complete stage and orch rehearsal. It is in German, but with English dialogue - a hybrid that in my view works really well, and a solution that we will be using for Beatrice and Benedict. The text is very well directed, and spoken with complete clarity without amplification or surtitles. (The titles here are seat back a la Met) Tobias Hoheisel's simple all purpose set is a model of its kind and the cast includes the wonderful Papageno of Joshua Hopkins - an outstanding Canadian baritone, a real find. And I loved the idea of a French Pamina, the remarkable Natalie Dessay. Her English is excellent but unmistakably French - delicious! Will be lunching at the Ranch (aka Opera) then some auditions, dinner with David and the miraculous Director of Press stuff here Joyce Idema, so well known and loved by all in Chicago especially the CSO family which she adorned for so long before retiring to Santa Fe. Of course her presence here was noticed and she was dragooned into serving the Santa Fe Opera. What a coup for them - and how much she loves this great institution now celebrating its 50th birthday! My computer has died on me so I am improvising on David's fabulous 17" Mac. But this means no illustrations for the time being! All quiet here - nothing but development activity with our production department off season and on vacation. But I will be in Santa Fe from tomorrow until Thursday. Their season opens this coming weekend and I will only see Dress rehearsals - but it will be very good to be there without the crowds. The scenery is the same and the hassle is reduced. You can rely on me for a full report. Yesterday afternoon was LOCAA time - in this case a run through by LOCAA members of Cosi fan tutte. The six involved are all the understudies for the Cosi production at Lyric in February 2007. I have seen a good many understudy run throughs over the years since the first in 1962! This one will certainly keep the curtain up if necessary - but by February who knows? - maybe more than that. There is lots of time. But I was delighted to see Kathleen Kimm tackling Despina - she will be very good. And then yesterday evening to Grant Park for an exceptionally enthusiastic performance of Mozart's glorious 25th Piano concerto by Robert Levin. Enthusiastic and good! Most enjoyable. And since the rehearsal on Thursday they really fixed the sound. I popped in yesterday morning to the rehearsal as well and saw Grant Park's boss Jim Palermo and chorus director Christopher Bell having an energetic exchange with the sound master controllers. Evidently to very good effect. 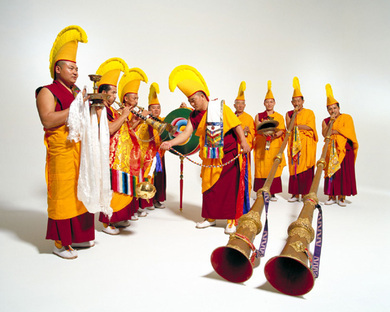 And the Mozart Requiem with Tibetan interspersals from the monks of the Drepung Loseling Monastery in Atlanta? Well the monks were amazing and their instruments extrordinary, both the vocal ones of the "drone" bass and the wind instruments - see the "band" here above! Here was a splendid example of multicultural Chicago at its very best. And by the way Carlos Kalmar and his chorus, orchestra and the all-Canadian solo quartet more than held their own! Who says there aren't still divas out there? This beats most of them: "To my taste she didn't understand the role," Angela Gheorghiu told the BBC before stepping into La Divina's shoes at the Royal Opera House. It was one among many eyebrow-raisers that heralded the arrival of the Romanian diva in a new production opening June 13. Madame also was reported to have declined to attend a rehearsal, allegedly stating: "If the conductor wants to know the tempo I take he can watch the film." A quiet damp day - shortened by a visit to the dentist - aargh! But I popped into Millennium Park to hear some of the rehearsal of the Mozart Requiem for the concert tomorrow evening. Luckily managed to see and chat to Michael Colvin and Nathan Berg - respectively Tenor and Bass soloists. Michael was of course with us earlier this season. The last time I saw Nathan was i n Dunkirk of all places! This was 11 years ago where he was singing Figaro (also seen here left with Katerina Karneus) in a production conducted by Jean-Claude Malgloire, one of the earlier generation of successful baroque specialists. No idea what has happened to him. All sounds good although it takes some getting used to outdoor concert "halls". But this is one of the best. A delightful lunch with Jerry Fuller. We made some progress on putting together a nice program for Ars Antigua's March 10 concert. We should have around 30 minutes of Ulisse as a preview of our production which opens at the end of that month. Otherwise nice and quiet with some time for reflection. This is the time to dream about 2009 and 2010! Peter Ascoli's party yesterday evening was attended by the great and the good of Chicago - plus me. There were many great fans of COT there - but Peter sits on other boards as well including of course the Harris Theater and the Chicago Chldren's Chorus. It was a good gathering of common interests in this city which has such mature appreciation of good music and the arts. And he signed many books as well as speaking most warmly and movingly about his grandfather Julius Rosenwald who, he confessed, did have some warts. But we were all greatly delighted to be there and went off much the wiser knowing that this remarkable man had made this colossal contribution to so many lives here in Chicago and more widely. Friends of Peter hosted this evening in their splendid abode on East Lakeshore Drive - seen here. And wonderful it is indeed. Tomorrow have have a long awaited meeting with our colleague Jerry Fuller, stalwart violone (see right!) and bass player of the COT orchestra whether playing Monteverdi, Handel, Mozart or Rossini. He is a leading light in the world of Baroque music in this city and runs a great organization, Ars Antigua, with whom we expect to collaborate next year in connection with our Monteverdi Ulisse. Such is the variety of life in Chicago. Meanwhile the Cubs are vanishing without trace - though as I write this they appear to have scored eight runs in the third. Wow! Another pleasure of being there is that there is always some kindred spirit that I have not seen for some time. So its a good gathering place. And t here is always a great exhibition in the first floor (ground floor to us) gallery. This time it is - Daniel Buren's "Crossing Through the Colors" - wonderful! Click the image to see it bigger. This evening our long standing board member Peter Ascoli (still with us I am glad to say) will be signing his new book, a biography of his grandfather Julius Rosenwald. It has been some years in the making and has been wonderfully received. All the COT family are thrilled that Peter has had such a success with this - we all know what a labor of love it has been.